Hello Merriam, I just wanted to write and thank you for the speedy delivery of the priest's stole that I ordered. Thought I would share with you the 'back' story of the purpose of my order. I have a friend who happens to be a Roman Catholic priest. He drives a Toyota and was on his way to Boston to round up homeless people and get them into shelters out of the cold for the night. As he was leaving his house here in Hampton, his vehicle suddenly accelerated and he ended up submerged in a marsh! Thankfully he was unharmed, but his possessions were lost, and one of them was his stole. I felt so bad for him and so I went online seeking a replacement. 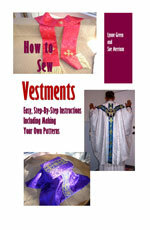 I was getting discouraged because all the sites that sold vestments were asking for over one hundred dollars for a stole! Then I found you! When I opened the package, I was impressed with the quality of workmanship and fabric. It's lovely. I will be gifting Father when I see him this weekend. Merriam, thank you for helping me bring a smile to a good man. Much luck in all your endeavors!! !